UPDATE: Channel 4 announced that Brailynne has been reunited with her family on Monday evening. She had been found in a car with two men during a routine traffic stop. She was taken to the hospital as she seemed not well. She was released and authorities notified the family. Rankin County Sheriff Bryan Bailey said Brailynne Corr was located safe. 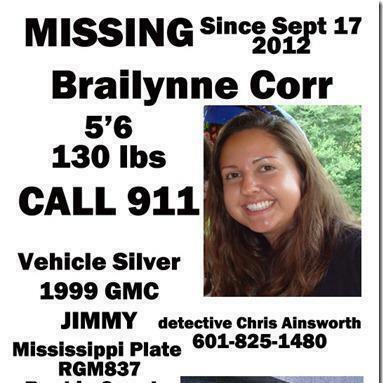 Previous story: Brailynne Corr, 22, is missing from Jacksonville, Mississippi since Sept. 17, 2012. She was last seen two days later on the 17th at a Walmart in Picuayne, Miss., 3 hours away, reports First Coast news. “She’d gone to Walmart, gone in bought gum, then bought gas and went inside again to get bottled water,” said Lou Anne McCormick, a friend that is trying to help locate her and spread the word via Facebook. No signs of her since, no evidence of using her credit card. “A really good girl about checking in with Mom and Dad constantly, totally out of character for her,” McCormick remarked.She may be driving a silver 1999 GMC Jimmy with plates RGM837. If you see her, please call 601-825-1480.